Dentist Denver, NC: Can Coconut Oil Cure Dental Issues? Can Coconut Oil Reverse the Effects of Cavities? We live in a wonderful time. All of the information a person could want is just a few clicks away on their search engine of choice. Wondering how to fix a dishwasher that’s not draining? Trying to remember who was president from 1901-1909? Want to learn how to use mortise and tenon joints to repair an antique dresser? All it takes is a few minutes of searching and you’ll find everything from written articles to YouTube videos telling you everything you’ve ever wanted to know. Unfortunately it also means that there’s a fair amount of misinformation floating around out there. Sometimes it’s unintentional, and a person who genuinely wants to help doesn’t have all the facts or they’re a little misguided. Other times it can be more malicious. The point is simply that, as the old saying goes, you can’t believe everything you read. It’s with that idea in mind that we’d like to tackle the answer posed by the title of today’s blog. Can coconut oil reverse the effects of cavities? It’s probably something you’ve seen online before and you’ve wondered if it works. Is coconut oil the miracle the internet claims it to be? A dentist is a reliable person to turn to for an answer, and that means you’re in the right place. So what do we know to be true about coconut oil? Keep reading to find out. Some say that it can help you to lose weight. Others say that it’s the perfect natural addition to your hair to keep it from getting dried out. There are claims that it can speed up healing from wounds. When it comes right down to it, coconut oil is praised as a cure for pretty much anything from Alzheimer’s disease to stress. While we won’t be diving into those claims, the one we will be tackling is whether or not it can help to reverse the effects of cavities in your mouth. Perhaps you have heard of oil pulling. All this means is that you put a tablespoon or so of coconut oil in your mouth, swishing it around between your teeth in an effort to make your mouth healthier. The number of claims about what exactly it can do range quite a bit. Some say that it can fill the cavities in your teeth if you do it often enough. Others say that it’s simply good for getting rid of built up plaque and helping people who suffer from gingivitis. “But wait a second,” you think to yourself. “Didn’t I just read a study about a Harvard professor who referred to coconut oil as ‘pure poison’ or something?” You did indeed. Like we said, the claims about what coconut oil can or cannot do range pretty wildly. So what’s true? Let’s take a look at the facts. Here’s one fact that will absolutely stand the test of time: if something is good for you one day, it will be bad for you the next. The opposite is also true. Low-fat foods are bad for you! Low-fat foods are good for you! Coffee can give you heart disease! Coffee is full of antioxidants! Taco Bell’s meat isn’t real! Taco Bell is delicious! You get the point. How many times have you heard that eggs are bad for you? Probably as many times as you’ve heard that they’re a healthy and excellent source of protein. The reality is that as with many things in life, the key is in moderation. After all, water is a great thing, and no one would dispute that! But drinking too much of it can give you water poisoning, so…there’s that. The point is that if you take a measured approach to all of the claims out there, you’ll likely be better off in the long run. 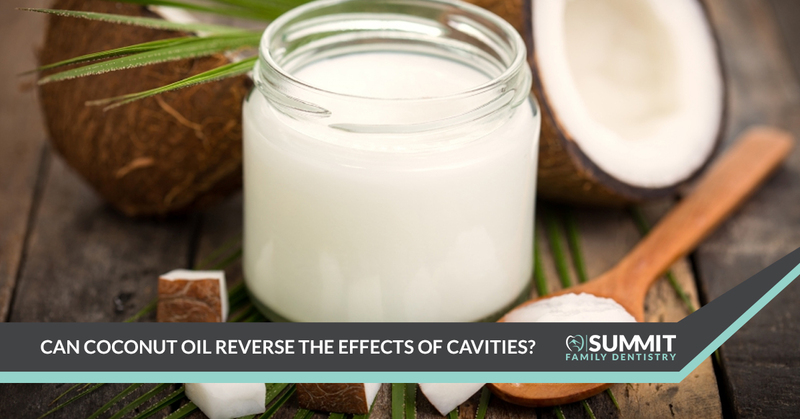 So when it comes right down to it, can coconut oil reverse the effects of cavities? The science that’s out there on this claim doesn’t seem to be too solid. Can it help with gingivitis or with getting rid of plaque? We’ll say that this one seems a little bit more plausible. Does it do all of the other things people claim it does? We’ll let you do your own research on that (but remember to only use trustworthy websites and not the ones who want to sell you a subscription to Dr. Curebody’s 20 Miracle Cures That Will Change Your Life That You Have to See to Believe!). Gently massaging your gums is never really a bad thing, and swishing a liquid around in your mouth will help to loosen up plaque. Does it have to be coconut oil? That’s up for debate. Our conclusion is that it probably won’t hurt you at the very least, but it might not be as beneficial as some of the articles on the internet claim it is. There are a number of so-called superfoods out there, but science currently doesn’t seem to validate the claims that are made about many of them. It’s best to take them with a grain of salt (which by the way is really good for you and also really bad for you). What does all of this mean? Eat fruits and vegetables for a balanced diet, drink enough water, and take care of your teeth with a consistent routine. Talk to your dentist about what you specifically need to do as part of your oral care routine. As of the time of this post, there’s no cure-all for anything other than to do your best and seek qualified advice whenever possible. Is It Time For You to See a Dentist? When it comes right down to it, the absolute best thing you can do for your teeth is to see a dentist a couple of times each year. If you’re searching for a dentist in Denver, NC, we hope that you’ll visit Summit Family Dentistry! We pride ourselves on offering our patients the best dental care possible and we’d be happy to see the whole family. We believe that it’s important to make a trip to the dental clinic a regular part of your routine because it allows us to keep an eye on things, providing you with personalized care. In other words, we’re the professionals that you can trust to steer you in the right direction. Schedule an appointment today and rest assured that you’ll be in good hands. We look forward to hearing from you!